A tightly fastigiate tree with dark green mildew resistant foliage. 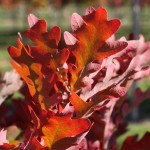 The fall color is bronze to dark red, and eventually a muted tan. The leaves stay on the tree until the following spring. 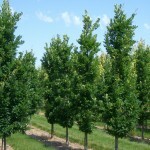 It prefers full sun and is adaptable to many soils. It makes a great screen, narrow street tree, or accent in the landscape.